The forest shares its name with bairros or neighborhoods of Tijuca and Barra da Tijuca that contain its entrances. It is located in a mountainous region, which encompasses the Tijuca Massif. The word Tijuca from the Tupi language means marsh, and is a reference to the Tijuca Lagoon in the contemporary Barra da Tijuca. The forest forms a natural boundary that separates the West Zone of the city from the South, Central, and North ones, and the North Zone from the South one. The park is part of the Carioca Mosaic, established in 2011. Cascatinha da Tijuca (Small Cascade in Tijuca), by Nicolas-Antoine Taunay (1755–1830). The Tijuca Forest is a man-made reclamation of land around Rio de Janeiro that had previously been cleared and developed to grow sugar and coffee. Replanting was carried out by Major Manuel Gomes Archer in the second half of the 19th century in a successful effort to protect Rio's water supply. 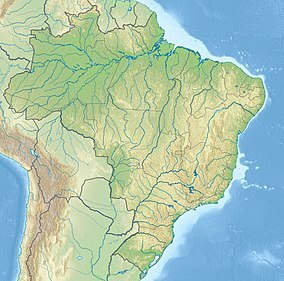 This followed concerns made by the Brazilian Emperor Pedro II in 1861 about erosion and deforestation caused by intensive farming, as declining levels of rainfall had already begun affecting the supply of drinking water. A train runs through the forest en route to the Christ the Redeemer statue atop Corcovado. In 1961, Tijuca Forest was declared a national park. The Forest contains a number of attractions, most notably the colossal sculpture of Christ the Redeemer atop Corcovado mountain. Other attractions include the Cascatinha Waterfall; the Mayrink Chapel, with murals painted by Cândido Portinari; the light pagoda-style gazebo at Vista Chinesa outlook; and the giant granite picnic table called the Mesa do Imperador. Among its impressive peaks is the Stone of Gávea. The Tijuca Forest is home to hundreds of species of plants and wildlife, many threatened by extinction, and found only in the Atlantic Rainforest (Mata Atlântica in Portuguese). The vegetation is so dense that scientists have estimated that ambient temperatures in surrounding areas have been lowered by up to 9 °C. The forest also contains some 30 waterfalls. One favela exists in the Tijuca Forest. Its inhabitants are mainly the descendants of those who migrated to the region in the 1930s to take part in the replanting effort. Though conditions have improved recently under the Favela-Bairro Project, Mata Machado still contributes to environmental degradation in the forest. For trekking, the most common destinations are: Diamantina's waterfall, Parrot's Beak (Bico do Papagaio), Tijuca's Peak (Pico da Tijuca), Cave Circuit (Circuito das Grutas), Archer's hill (Morro do Archer), Anhanguera' hill (Morro da Anhanguera), The Excelsior's lookout (Mirante do Excelsior) and the Bat's cave (Caverna dos Morcegos). ^ Katlego Disemelo (23 May 2013). "Is Johannesburg the world's largest man-made forest? The claim is a myth". Africa Check. Retrieved 2013-09-30. ^ Mosaico Carioca de Áreas Protegidas – MMA, Mosaico Carioca. ^ a b "Rio De Janeiro - Tijuca National Park". Hidden Journeys - explore the world from the air. Retrieved 2014-07-08. Wikimedia Commons has media related to Parque Nacional da Tijuca. This page was last edited on 1 February 2019, at 00:58 (UTC).